ST. GEORGE — The Desert Hills Lady Thunder, who won the Region 9 championship last week, went undefeated on Thursday’s opening day of the state 4A championship at Salt Lake City’s Liberty Park. Desert Hills won all 10 of its matches over the first two rounds in straight sets to take a narrow first-day lead over Ridgeline and Park City, the respective No. 1 seeds from Regions 12 and 11. The Lady Thunder are hoping to end Park City’s four-year reign as state champs. “The team is peaking at the right time,” Desert Hills head coach Dave Smith said. Desert Hills is the only school to have all of its players in all five brackets still in contention at the tournament, as both of Park City’s doubles teams were eliminated by upset losses in the quarterfinal round, while Ridgeline’s second doubles team lost to Orem that same round. After a one-day break Friday, the 4A tournament will wrap up with the semifinals and finals on Saturday. 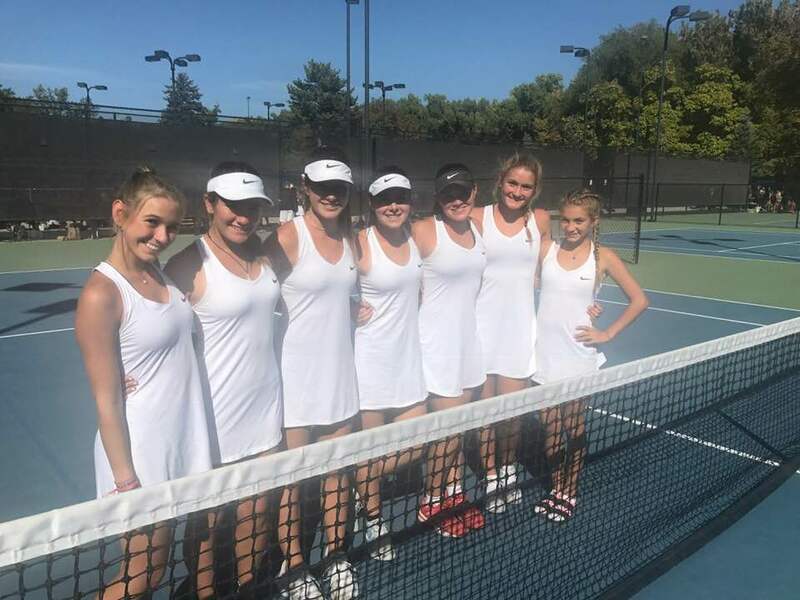 Aside from Desert Hills’ dominating first-day performance, Region 9’s Pine View also saw three opening-round wins Thursday while Dixie had two, but Pine View’s first singles player, freshman Taylor Parsley, was the only non-Desert Hills player from Region 9 to advance past the second round. Parsley, Region 9’s No. 1 seed, defeated Sky View’s Betsy Hixson in the first round, 6-0, 6-1, then cruised past Tavah DeHart of Salem Hills in the quarterfinals in a similarly convincing fashion, 6-1, 6-1. Also in first singles, Desert Hills junior Morgan “Mo” Behymer won both of her matches handily as Region 9’s No. 2 seed. After beating Green Canyon’s Rachael Dursteler in the opening round, 6-0, 6-0, Behymer then dispatched Sydney DeGraw, Region 10’s No. 1 seed, in straight sets, 6-3, 6-1. In Saturday’s semifinals, Behymer will face Park City’s Livi Rockwood, Region 11’s top seed, while Parsley will take on Naya Tillitt of Ridgeline, Region 12’s No. 1 seed. The winners of those two matches will then play each other for the state championship Saturday afternoon. Also, in first singles, Dixie’s Ashley Kezos, Region 9’s third seed, defeated No. 2 seeded Yeeke Wang of Logan in the opening round, 5-7, 6-2, 6-2. Kezos then lost in the quarterfinals to Rockwood. In second singles, Mackenzie Telford of Desert Hills first defeated Danika Hancock of Payson, 6-2, 6-2, after which Telford beat Caroline Jessen of Ogden in the quarterfinals, 6-2, 6-3. She’ll face Lucy Lyons of Ridgeline, Region 12’s No. 2 seed, in Saturday’s semifinal. Also winning their first-round matches in second singles were Brielle Callahan of Pine View and Kalli Beckstrom of Dixie. Callahan defeated Tae’a Rees of Orem, 6-1, 6-1, while Beckstrom defeated Clover Carter of Salem Hills, 6-2, 6-1. Both Callahan and Beckstrom were eliminated in their respective quarterfinal matches, however. In third singles, sophomore Tia Turley of Desert Hills scored an opening-round win over McLayne Arnold of Bonneville, 6-3, 6-1. Turley then eliminated Madi Gray of Green Canyon, 6-3, 6-4. She’ll next face Park City’s Brooklyn Thompson, Region 11’s No. 1 seed, in Saturday morning’s semifinals. Also from Region 9 in third singles, Cameron Miner of Pine View beat Liz Fidler of Stansbury, 6-1, 6-0, only to lose her second match to Madi Brenchley of Ridgeline, 6-1, 6-0. In first doubles, Desert Hills’ top-seeded duo of Faith Hess and Cassidy Kohler earned a 6-1, 6-0 opening round win over Mountain Crest’s Madelyn Hardy and Sarah Nielson. Kohler and Hess then defeated Orem’s Mimi Bowman and Aspen Jones in the quarterfinals, 6-0, 6-3. The DHHS duo will next play Heather Roskelley and Annie Spach of Logan, Region 12’s No. 1 seed, in Saturday’s semifinals. Also in first doubles, Dixie’s Angela Crooks and Ashley Stevens came from behind to win their first-round match over Bear River’s Kelsey Larkin and Lindsey Larkin in three sets, with the third set ending in a tiebreaker. The score of the match was 1-6, 6-1, 7-6 (4). Crooks and Stevens then lost their ensuing quarterfinals match to Uintah’s Kaitlyn Callahan and Kassidy Callahan, 6-1-6-4. 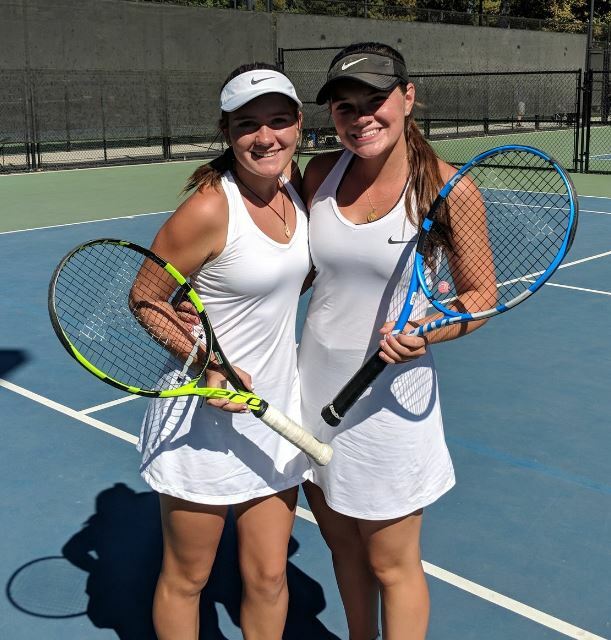 In second doubles, the Desert Hills pair of senior Lyndsi Graf and freshman Averee Beck rolled to two easy wins Thursday, first defeating Cozette Caron and Sage Staheli of Payson, 6-1, 6-1, followed by a 6-1, 6-0 quarterfinal victory over Hailey Brazier and Mikell Angeli of Stansbury. Graf and Beck will face Orem’s Gabby Bailey and Abby Dunn, Region 10’s top seed, in Saturday’s semifinals. Smith said his players plan to take it easy Friday, with a light practice followed by a movie and plenty of rest before Saturday’s concluding matches. What a bunch of cuties. Is it legal to say that about high school girls? You know what, I don’t care if it’s legal or not, I’m saying it.